Pexip will introduce a suite of Pexip Infinity videoconferencing clients at InfoComm 2014, starting tomorrow. The suite will expand users' options for joining Pexip meetings, by providing the clients as installable software for Windows, OS X, and Linux, in addition to supporting all major browsers. Users can engage in visual meetings on any application, including desktop, WebRTC, and non-WebRTC browsers. The soft clients give users the freedom to manage their meetings and see presentations and other conferencing participants with user-friendly features including muting and the ability to add or disconnect meeting participants. "Pexip Infinity already provides industry-leading interoperability for voice, video, and data collaboration to tens of thousands of users around the world," said Håkon Dahle, Pexip CTO. "By introducing new clients and by leveraging browser plugins in addition to WebRTC, users without an existing software client can now fully enjoy the power of visual collaboration. Joining a Virtual Meeting Room has never been easier." For users without access to an endpoint or UC client, the new Pexip Infinity clients bring instant meetings to anybody's fingertips — even allowing organizers to simply send a link to collaborators outside the organization to join virtual meetings from any browser. It's that simple for anyone to join a Pexip meeting. Pexip Infinity is a distributed, scalable platform that allows everyone in an organization to communicate face-to-face when meeting to collaborate. 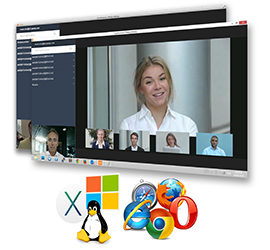 Providing Virtual Meeting Rooms for any user through video, voice, and mobile devices, the introduction of soft clients and browser plugins allows anyone to easily join a meeting from the most popular operating systems and browsers — offering a software-based solution for enterprises searching for a simple videoconferencing solution.